Artist's illustration of Raytheon's Standard Missile 3, a current defensive weapon system designed to destroy short- to intermediate-range ballistic missiles. "Both China and Russia possess the MIRV capability for their ballistic missiles. In 2014, reports confirmed that Iran too had developed Multiple Re-entry Vehicles (MRVs) for their ballistic missiles. Cold War literature suggests that MIRVs are first strike weapons and could be strategically destabilizing," independent consultant Debalina Ghoshal wrote in a June 2016 report for the Federation of American Scientists. "The United States realizes these threats and is working towards a robust missile defense system," she said. 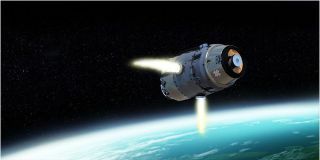 Last year, the U.S. Missile Defense Agency awarded contracts to Raytheon, Lockheed-Martin and Boeing to begin designing what is known as a "Multi-Object Kill Vehicle" or MOKV, which could destroy several objects in space with a single launch. "Ten years ago, we had a single kill vehicle on a single interceptor. Kill vehicles today are the size of a toaster … This MOKV program is the latest iteration," John Pike, director of GlobalSecurity.org, told Seeker. Raytheon's plan, which is scheduled for a concept review in December, is to load multiple MOKVs onto a single missile for launch. Each MOKV would be outfitted with sensors, a steering and propulsion system and communications equipment that will allow them to zero in on an individual target and hit it, destroying the object by sheer kinetic forces. The impacts would take place beyond Earth's atmosphere, but on a trajectory that would send the resulting cloud of debris back into the atmosphere, where it burn up, Pike said. RELATED: Is Russian Mystery Object a Space Weapon? A major technological challenge is figuring out how to differentiate between bombs and decoys, such as balloons that look like they might have a hydrogen bomb aboard. The military hopes to begin proof-of-concept demonstrations late next year and a non-intercept flight test in 2018. If successful, the Missile Defense Agency would conduct an intercept test in 2019.